Used PILOSIO Magnum, Heavy Duty Clamp Wall Forms & Hardware Now Available In Good Condition. Reach our sales department for GREAT pricing. 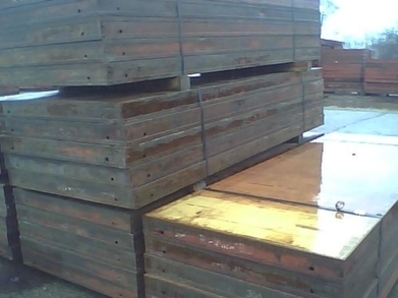 We specialize in Used Clamp Wall Formwork Like PILOSIO P300, Magnum, & Minimag. Magnum standard panel is 240x300 cm (7.2 sq.mt) and needs only 4 tie-rods and 2 clamps. Its strength and functionality are the more significant factors for medium or big enterprises operating in large worksites. Magnum formwork is projected to be submitted to pressure un to 60 kN/sq.mt for the standard version and up to 100 kN/sq.mt in the reinforced version, a must for a casting above the average combined with SCC self-levelling concrete, even more adopted when complicated shapes are to be done. The edge profile, projected for toughest work, has a special section to protect the 18 mm plywood and to achieve perfection in joining and aligning panels on wide surfaces with the clamps. To enhance the already exceptional performances, magnum formwork has also been projected to fit Minimag formwork simply by using the adjustable clamp. This application is really useful when casting large surfaces to create niches, where Minimag panels give Magnum extreme flexibility and the easiest management. Magnum panels have a 12 cm edging profile, made under specification of Pilosio, that needs 2 tie-rods only for a high of 3 mts. The perfect aligning of the system and the limited need of tying accessories make possible Magnum is moved in one pull (up to 9.6 x 6.0 mt) minimizing the time of handling of the system. As integration to the Magnum system, its accessories make possible outstanding result in one-side casting up to 7,5 mt high, climbing casting, walls and pillars up to 10 mt H and any other manufacture in solid concrete.